Storytlr, the lifestreaming service with a twist, has updated their product by introducing “Pages” to their already impressive line of features. Storytlr is a lifestreaming service that set itself apart from other services by allowing users to group their posts from various services in an storyboard format. From the beginning, Storytlr has had two tabs on their pages indicating the lifestream and the stories list. With this latest update, additional tabs can be added with a media grouping flavor. The obvious two page additions that Storytlr allows you to configure are Pictures and Videos. These two pages will collect only the pictures or videos from your various sources and display them in a grid of thumbnails. When a visitor clicks on an item, instead of being directed to the place of origin, the video or picture is displayed in a modal window type overlay. As many of your pictures and videos can contain additional information or excellent commentary in the comments sections of each item, some might prefer the link to go directly to the object’s page rather than the overlay. In addition to these media pages, you can add additional lifestreams that only display items from the specific services you select. The best example of this would be a page devoted to all the blog posts you may have aggregated into your lifestream, as they now would be separated from the complete lifestream. (As outlined on the official blog.) The page feature also allows for a tab that links to an external site or a custom page, where you can enter in your own HTML (i.e. an About Page). The pictures and video pages work well for the most part. The pictures page found all the information from my Flickr account as well as any picture posted on Tumblr and were well displayed and ordered by date. The video section does have its bugs to be ironed out. 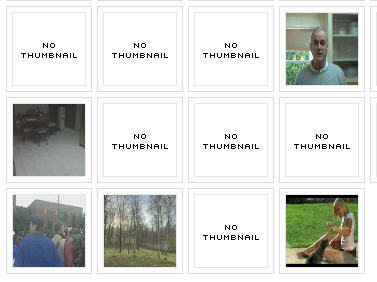 Items posted from Vimeo, Qik, and YouTube show up on the Video page with nice thumbnails available. But Tumblr post of YouTube and other videos are labeled with No Thumbnail. (I heavily leverage Tumblr instead of the Like feature on YouTube). This update also includes a unified tagging system and a new theme. Storytlr will now include tags from the services it imports and gives you the option of having a tag cloud widget on your stream. Also a user has contributed a new and very minimalistic theme that you can now select for the design of your lifestream. With improvements like these, Storytlr is setting themselves apart from other lifestream services adding features above and beyond basic lifestreaming. Storytlr still holds its own among all the other lifestream competitors available. But one wonders how long they can continue to grow the lifestream service without adding to its comparatively small list of supported sites (only 16 services as of this writing). See Official Storytlr Blog about the update. Thanks a lot Trae for your review ! As always, it is great to get your feedback and to see that you liked our updates. I'll take this opportunity to give you a sneak peak at our next release: improved bookmarklet that makes it much easier to post videos or other kind of embeds, and post by email so that you can start posting on the go more easily ! Thanks for the sneak peak. 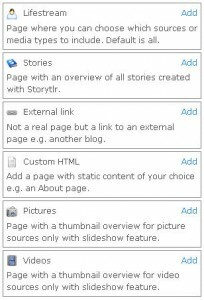 Those features will be excellent for people using Storytlr as their primary publishing platform! I think about doing this all the time, but I can't leave my tried and true WordPress…it's just too hard. hehe. I disagree with the 'long tail' comment about additional service. Where I agree that the sites that offer 190+ services use that as a selling point but off little in user experience (where you offer a great experience), I don't believe that Storytlr does hit all the core uses of the social web. Addition of 12seconds and Brightkite are nice, but I question this when your Uservoice lists Book sites (Readernaut, GoodReads, All Consuming, etc. ), Amazon's Wishlist, and Yelp all above a 12seconds and Brightkite implementation. Like I said, inclusion of a massive amount of services is not going to drive traffic; but inclusion of 1 or 2 of _all types_ of services will. I look at it this way, you support Qik, Seesmic, Vimeo, and YouTube. The addition of 12seconds is icing, but not necessary. You support Digg and StumbleUpon, (Google Reader sort of falls in here as well), so not having Mixx, Reddit, or Propeller is no big deal because the experience with what you do support is excellent. Similarly with Facebook, Twitter, and identi.ca, Jaiku or Plurk is not needed. Brightkite, since it has location features, is a good addition and adding something like Fire Eagle would help as well. Again hit the services _subjects_ and the rest is filler. You support Delicious, (in my opinion) add Furl and your set, no need for Ma.gnolia or Diigo. Picasa and Flickr make up great photo sources so the addition of Zoomr or SmugMug is not necessary. Last.FM is all you have in the music space, so adding Pandora or Blip.fm would help a bit. Travel sites like Dopplr and software usage sites like Wakoopa would also be a great inclusion to the service because their usage differs from any other service currently supported. Meeting the core needs of every type of service is what is asked for, as opposed to a blitzkrieg of services. The best part about Storytlr is the beauty of the service, adding Pages and these Mediastreams only helps that. But being able to combine that beauty with the ability to hit all aspects of my online life is what can make Storytlr the defacto site in lifestreaming. Also, although I probably won't use the social aspects of a Lifestream service (I'm willing to be proved wrong here though), I knew it was inevitable and will welcome it. Thanks Laurent, and keep up the good work. chaussures louboutin marque rouge les semelles sont à la mode incontestable des timbres de l’excellence.christian louboutin pas cher. Depuis le lancement,christian louboutin homme, son label élégant,Chaussures Louboutin Soldes, en 1991, le designer fran?ais a été fidèle à son but “chaussures réparées,Christian Louboutin Escarpins, comme des bijoux?. De la spectaculaire fines chaussures à talons hauts,Christian Louboutin Wedges, bottes et chaussures en tissu,Christian Louboutin Sandales, Christian Louboutin marqueterie est le principal de chaque femme pour le talon du ciel et accessoires convoitable.Christian Louboutin Bottes.